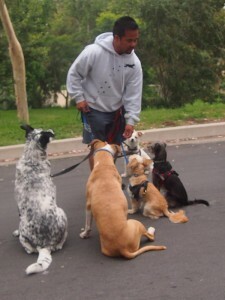 Active Dog Adventures fosters and promotes a scientific based, positive reinforcement training program. We widely utilize the clicker training method to accomplish teaching basic obedience, as well as working through behavioral issues. We also employ the use of the Gentle Leader to assist challenged canines to achieve a calm state of mind; we recognize and understand the unique personality of each pet. Therefore, we tailor training that best brings out your pet’s personality through fun, positive, and proven techniques. Our philosophy is to create a thinking dog, where making a mistake is still part of the learning process. We also encourage increased communication by exploring various ways to keep training upbeat and interesting for both humans and canines. Training is a constant part of life, learning, shaping, reframing. For both people and pets, once you stop learning, you stop living.